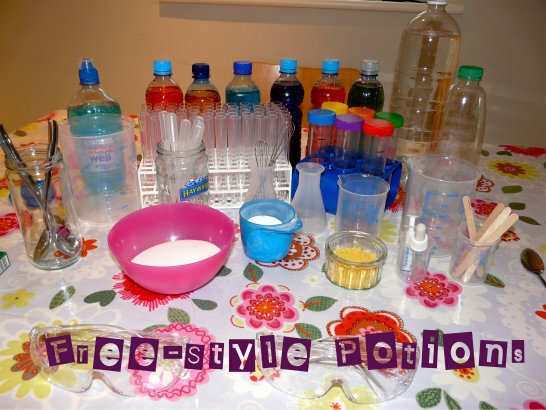 I’ve been wanting to set up a free-style “potions” invitation for my kids ever since I came across 10 More Magic Potions. 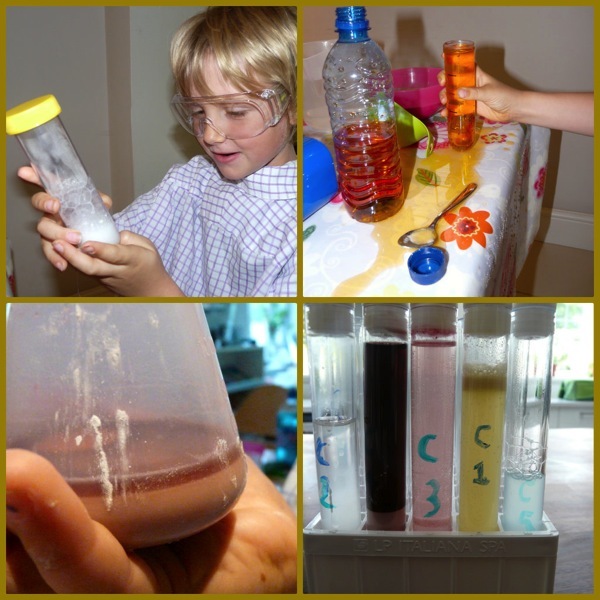 Since we gave up following a science curriculum we’ve played with density, slime, fizzy fountains, elephant’s toothpaste and red cabbage indicator among other things. 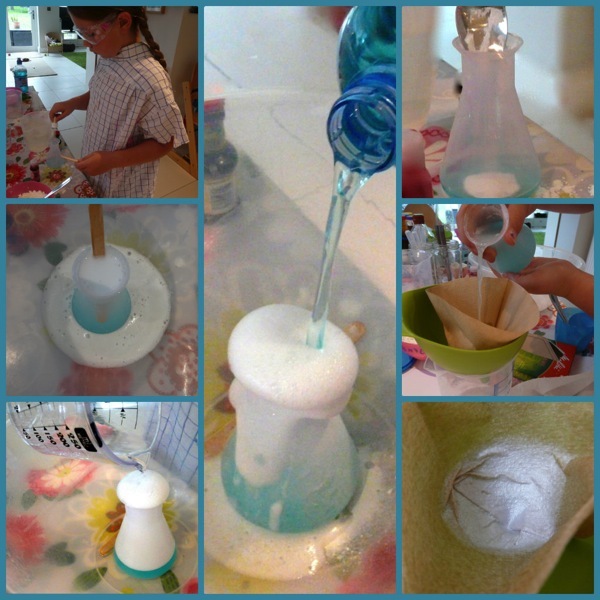 But, perhaps because we didn’t homeschool from the start, I’ve never set things up quite this way before, and I wanted to give C(9) and J(8) a serious chance to play before we move on to any more specific “potions” experiments (dissolving, separating liquids etc). A visit on Wednesday to Professor Snape’s potions classroom at the Harry Potter Warner Bros Studios was just the catalyst I needed! 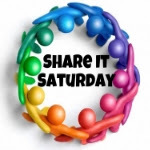 I was going to set up outside and suggest that the children collect additional supplies from the garden – dirt, leaves, and the like – but it started raining so we stayed at the kitchen table. I made sure we had plenty of kitchen paper and old towels on hand: one of the many learning points was how much liquid does (and doesn’t!) fit into different shaped containers. Once I’d shown the children the supplies, I left them to it and busied myself taking photos and notes. I didn’t put out food colouring in the interests of economy, but provided it at C(9)’s request – she wanted a more intense colour without water. 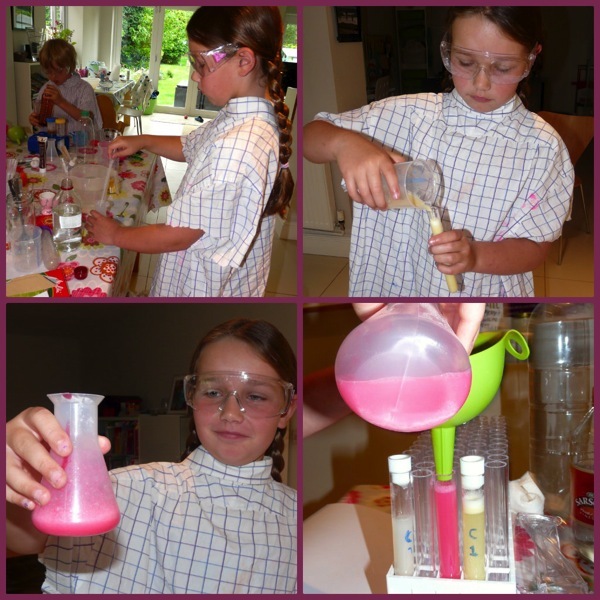 C(9) wondered, “How can I make this even more bubbly?” Later, she filtered her potion. The children had so much fun doing this, and I loved watching them learn as they played. Free-style potions has something for everyone! Wow, Tiger will love this. I’m bookmarking this for later. 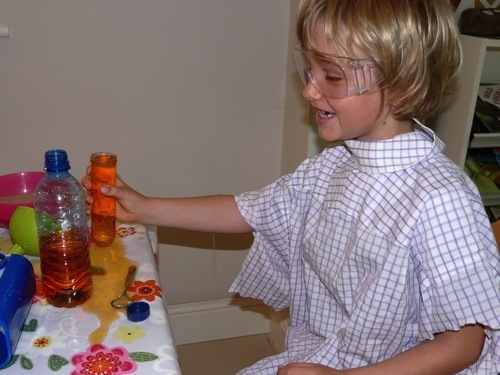 A lot of learning through exploration takes place when supplies are provided to children. C(9) and J(8) both look like they have had a great time! I’ve heard a lot of good things about the studio tour as well. 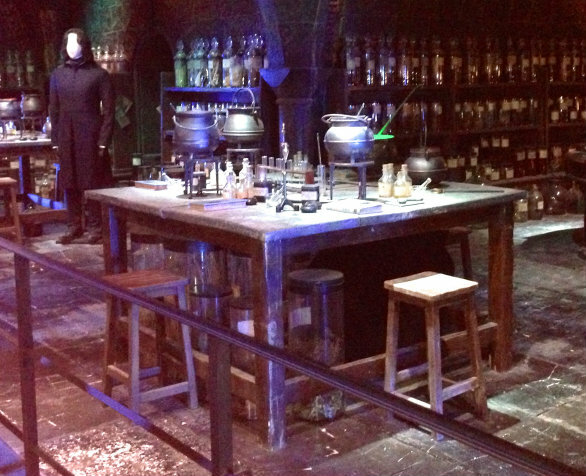 A perfect way to lead into this study of potions! I love that feeling of curiosity when I set something like this up – the children always surprise me with how they engage with the supplies, so I learn too. And they loved it. Looks like they were able to create lots of different colors and fizzy things. What a satisfying way to explore. One day they will make colours via chemical reactions, but for now food colour is a fun cheat! What a fun idea!!! The harry potter tour sounds awesome and what a great way for kids to have fun experimenting! Thanks, Cari, we all had a lot of fun! Mustard powder! How did I not think of that? Genius! I might have to do a repeat with that added. Such fun times! I know, I was pleased when I pulled that one out of the cupboard! There was me thinking “emulsifier” but actually C(9) was most intrigued by the pungent smell it made when she added water, compared with the non-smell of the dried stuff. Just goes to show you can’t predict the learning! That looks like great play learning 🙂 – so much fun for the kids to have the freedom to mix whatever strikes their fancy. I always love to visit your blog! There is something so refreshing and joyful about the way you approach your blog and your life that always lifts my spirits! I love these ideas! 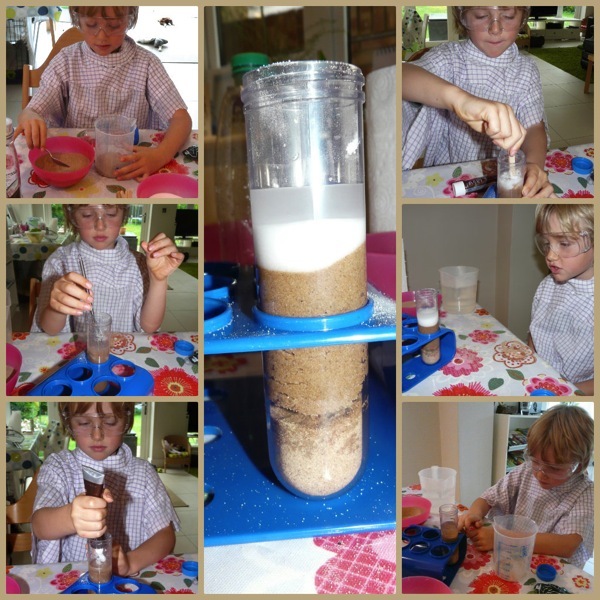 We have done the red cabbage experiments–it was awesome! i think we would happily do them again. Experiments are my favorite kind of science. I had 2 girls a week or so ago, and we did a lot of this sort of thing. It’s always popular. I bet the girls loved it. We had one of C(9)’s old schoolfriends over recently and I had him scraping crayons. I think he would have preferred potions! I remember doing this sort of thing repeatedly as a child. I loved it.